Liberia’s Vice President Joseph N. Boakai has reiterated the Liberian Government’s commitment to tackle the situation of Internally Displaced Persons (IDPs) through the ratification of the Kampala Convention. The Kampala Convention is the instrument adopted by the African Union to protect and assist internally displaced persons in Africa. 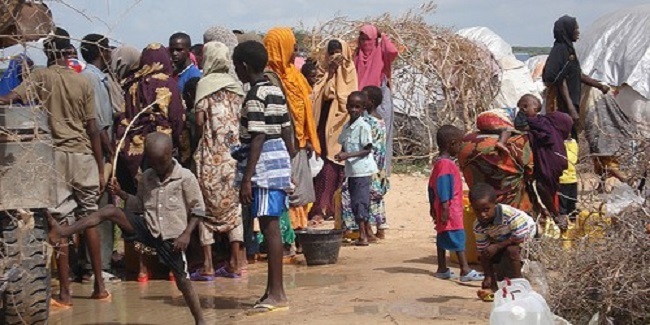 The convention, which was signed by African Governments in 2009, marked a milestone of preventing and addressing one of the continent’s most humanitarian crises. Vice President Boakai assured that the government remains committed to ensuring that the Kampala Convention is ratified and domesticated to provide protection and care for Liberians who have been displaced as a result of conflict or natural disaster. He gave the assurance Wednesday at the end of a three-day seminar for stakeholders held in Monrovia, the Liberian capital, to ensure the ratification and domestication of the Kampala Convention, which Liberia signed over three years ago. He stressed that the protection and care for all Liberians is critical to the growth and development of the nation, noting that the issue of internal displacement should not be taken for granted as anybody can be displaced at any time in life. “The downpour of rain in Monrovia and other parts of the country in recent times has made some Liberians to be displaced, which needs government’s intervention in their situation and this must be addressed through legislation,” he said. Vice President Boakai emphasized that the need to ratify the Kampala Convention is significant to tackle the problem of internal displacement in Liberia, noting that Liberia has experienced what it means to be displaced. The seminar for domestication of the Kampala Convention was organized by the International Development Monitoring Center based in Switzerland in collaboration with the Norwegian Refugee Council, the UN High Commission for Refugees and the Liberia Refugee Repartition and Resettlement Commission.